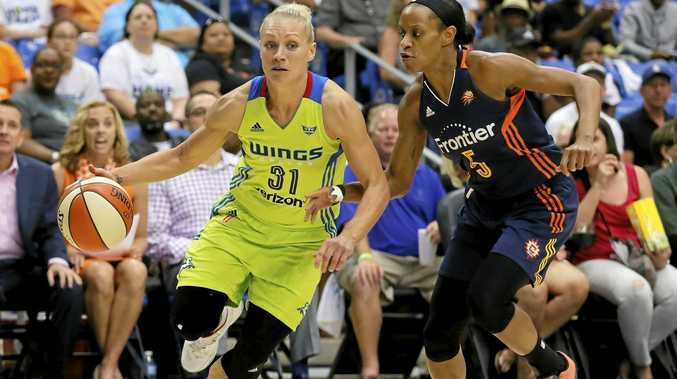 AUSTRALIAN Opals star Erin Phillips, the MVP of the inaugural AFL Women's season, has been waived by the WNBA's Dallas Wings. Phillips was traded to Dallas from the Los Angeles Sparks in March, 2016, and was set to enter her 10th season in the league. In her 2015 season with the Sparks, Phillips averaged 4.7 points, 1.2 rebounds, and 1.2 assists in 14.6 minutes per game, starting in 12 of 32 fixtures. Phillips has won two WNBA championships - with the Indiana Fever and Phoenix Mercury - and was named a co-captain of the Wings in 2016. Phillips is also a staple for the Australia national women's basketball team, the Opals, where she's won an Olympic silver medal (2008), as well as a gold medal at the 2006 FIBA World Championship. Most recently, Phillips suited up for the Adelaide in the AFLW, leading the team to the league's first ever premiership. The 31-year-old captained the side, and was ultimately named the league's most valuable player, best and fairest, along with the AFLW grand final best on ground. Phillips will enter waivers, allowing another WNBA team to potentially sign her.